August 25, 2003, L. G. Crabo. 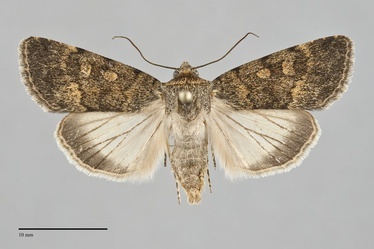 Sympistis sobek is a medium-sized moth (FW length 14 - 18 mm) with powdery yellow-green color due to a mixture of gray and yellow scales and a pale yellow-gray hindwing with a sharply defined dark gray marginal band that flies in west-central and southwestern Oregon during the fall. The forewing is slightly darker in the median area and there is a gradually darkening shade in the lateral subterminal area that ends at the subterminal line. The lines are dark gray to black, with increased yellow scales adjacent to the portions of the antemedial and postmedial lines outside of the median area. The basal line is short, near the wing base. The antemedial line is focally larger on the costa, slightly sinuous and moderately oblique from anteromedial to posterolateral. The median line is diffuse, usually darkest at the costa, sinuous across the lower half of the wing when dark. The postmedial line forms a spot on the costa, is weakly scalloped, excurved near the reniform spot, touching the lower spot, and oblique toward the wing base to the trailing margin. The subterminal line is yellow, irregular, variable in strength. The terminal line is a gray line, occasionally a series of spots. The fringe is striped gray and yellow at the base, gray distally. The orbicular and reniform spots are similar, gray with filling of slightly more yellow than the ground color. The orbicular spot is oval and the reniform spot is kidney-shaped. The claviform spot is absent. The head and collar are yellow-gray; the rest of the thorax is gray. The male antenna is filiform. 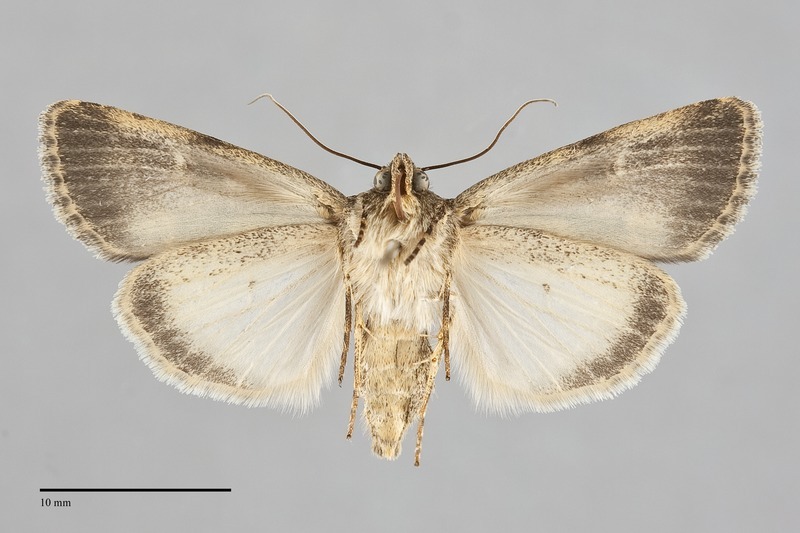 This species is most similar to Sympistis cherti, a common and widespread species with which it flies. This species is slightly larger and grayer, lacking the greenish hue from the mixture of gray and yellow scales that is typical of S. sobek. 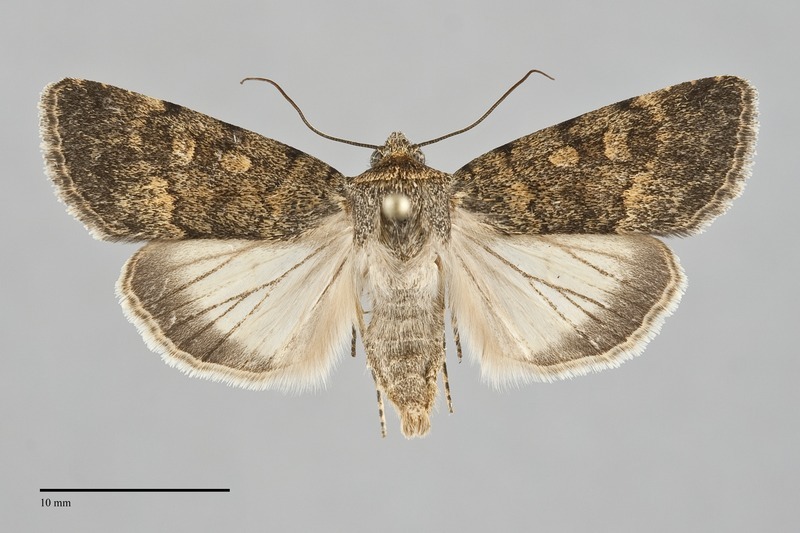 The hindwing of S. cherti is dark on the outer margin but lacks an even sharply marginated band like that of S. sobek. Sympistis sobek could conceivably occur with Sympistis pallida in eastern Oregon. As with S. cherti this species is gray, paler than S. cherti, without a green hue or sharply marginated hindwing. The type locality of Sympistis sobek Troubridge is USA, Oregon, Deschutes County, Horse Ridge Summit. This species is found on barren, rocky, serpentine ridgetops at moderate to high elevations in the Siskiyou Mountains. It occurs near basalt canyons in dry, open juniper woodlands at middle elevations in central Oregon. Sympistis sobek occurs most commonly in the Siskiyou Mountains of southwestern Oregon. It has also been collected in the southern Columbia Basin in Deschutes County, Oregon. This species has been found on Mt. Shasta in the Cascade Range of northern California. No information is presently available regarding larval foodplants of this species, but shrubs in the family Rosaceae are suspected based upon closely related species. This species flies in the fall, from mid-August to mid-September. It is nocturnal and comes to lights.